In the case of the dinosaur I could scale it down the model in the Cubify Client software to a size small enough so that he could clasp it in his tiny hand as he slept. But the Android was a different story. Take a look at its features. The Cube is a printer for consumers, not high-precision engineering. I knew that if I simply scaled the model down to fit the palm of my four year old the antennae would not build properly, if at all. I had some doubts about the arms left dangling outside the body as well. After some trial and error I ended up completely remodeling the Android and came up with this design that printed on my Cube without a problem. This is a single part, not an assembly of parts. 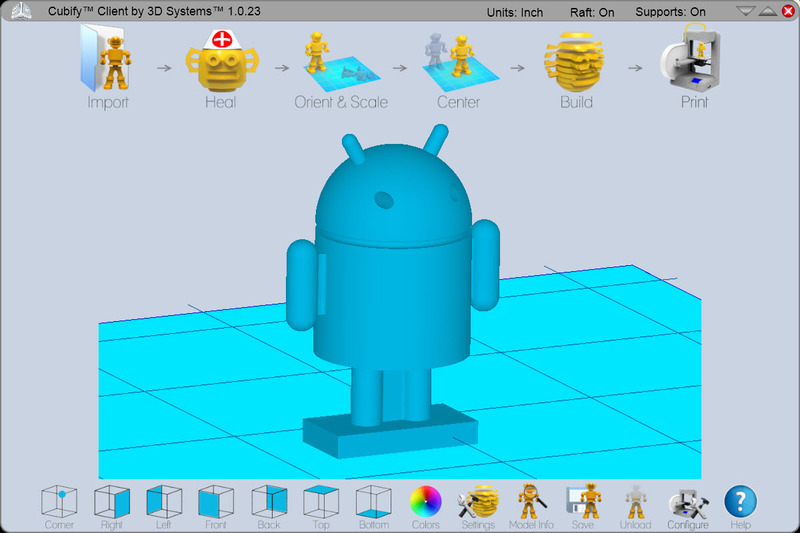 I exported to STL, imported the file into the Cubify Client and hit “Build”. It took an hour to print the tiny Android on the Cube and it came out like this. I chose to leave rafts and supports on due to the design. After removing the raft and cleaning out the supports I ended up with this. The thing is so small, my fat fingers had a tough time removing the raft and supports. This lovely Sunday evening I went fishing with my boys. Russell decided to take “Yoshi” and “Baby Android” along.